Today it's my job to explain the math behind the 4 patch - you might have noticed that I have been avoiding that word math in this series, but I guess we all need to face up to the fact that quilts involve a bit of geometry and arithmetic. I hope you will not close the page, and instead stick around to see how easy quilt math actually is. Jess, from Elven Garden Quilts, will be explaining how to recognize 4 patch blocks in quilts and showing you a nice variety of 4 patch blocks - this week we have divided up the deciphering work. As I tell you about 4 patches, I am also going to just tell you a bit about quilt blocks in general. And before that I must say that these are my thoughts and approach, I have no idea how the quilt police would view them. But I am hoping that you will find them helpful and interesting. And I am going to just randomly insert pictures of quilts and projects I have made with 4 patches. I hope you can recognize them, remember to check out Jess's post on how to do so. Squares are easy to divide up - and squares fit easily inside of bigger squares. Squares are easy to decipher. Let's look at those 4 patches. Since we know that quilt blocks are usually square, we can look at those and even if they are turned or slightly off centre, we can see enough to confirm that they are square. The simplest 4 patch is made up of 4 equal parts - and when you divide a square into 4 equal parts you get 4 squares. But how do I figure out how big the 4 patch is? Since we know that all the sides of a square are the same length, and we can see that the 4 squares in the 4 patch block are all the same size, geometry tells us that the length of the side of the inside squares is half the length of the side of the resulting 4 patch. So, if the inside squares were 1" squares, then we know that the resulting 4 patch unit must have sides that are 2" (2 times the inside square's 1" side). Or if we knew the resulting 4 patch was 12" then we would know that the 4 inside squares have sides that are 6" - half of the 12" length of the entire block. Often there is a clue to the size of either the four patch block or the inside squares that you can use to figure out the rest. For example, if I told you that my quilt was 36" across and you saw there were three blocks on that side you would be able to divide 36 by 3 and then know that each block was 12" square. If those blocks are 4 patches, then you will also know that the four square units in the 4 patch are 6" on a side. What about those 12" blocks - why do quilters use them so often? You might have noticed that in most quilt patterns you see 12", 10", or 6" blocks the most, and sometimes 20" or 24" blocks, and of these the most frequent is 12" blocks. The reason for that is again about math - 12 has a lot of factors. That is 12 can be divided by 1, 2, 3, 4, 6 and 12. The more numbers that easily divide into a number the easier it is to do the quilt math. Those other common blocks are also sizes with numbers that have more than two factors. Quilters are smart, so they pick easy math, I think mainly because easy math makes for easy cutting and easy cutting makes for accurate cutting and accurate cutting makes for nicely shaped blocks with pretty points and seam joins. As a result, it is very often safe to assume the blocks you are seeing in a quilt are 12". WAIT - don't forget the seam allowances! Here is the big trick about quilt math, at least in my view. First figure out the block and do the math. Only after that is done do you add the seam allowances. You can, of course, do all the math with the 1/4" seam allowances added in but that makes for math with fractions - not easy math. Don't make it hard. But then, it is critical to make sure you don't forget the seam allowances before you start cutting your fabrics. Quilter's use a 1/4" seam - I believe that is because all the seam allowances add weight to the quilt and since you are quilting it, the thinner seam allowances are not likely to lead to the quilt falling apart if they unravel a bit because the quilting on the quilt holds everything together well. How do the seam allowances get added to the calculations of the block? The simple rule, for quilts which use a square or rectangular grid - is - add 1/2" for every seam and 1/2" for the seam that will be on the edge of the block when you sew it into the quilt. You add 1/2" for each seam because when you sew together two pieces using a 1/4" seam allowance, the seam allowance now has two 1/4" from your units folded under the block. However, I find it easier to think of it differently, rather than worrying about the 1/4" from two different fabric pieces, I think of it as each fabric piece have 1/4" on both sides of it used up for the seam allowances when it is sewn in for each direction. So for each piece of fabric sewn into a block you need to add 1/2" onto its width and its length. Identify the block - is it a 4 patch? Jess will explain how to do that. Figure out the size of the block - often it will be a 12" finished block. Figure out the size of the units - a 4 patch made of four squares will have sides that are half the size of the finished block. Each of the 4 patch squares will be one quarter the entire size of the block. Add 1/2 for each seam that will be sewn. So for the 4 patches made of 4 squares - if the finished block is 12", each square will be 6.5" square and the unfinished block will be 12.5" square. What about 4 patch blocks that are not made of squares? If the units are squares when they are done - for example, the unit is a HST, then you can calculate the size of the finished unit and use that to decipher the inside unit. If the HST is trimmed to 6.5", you will want to start with fabric squares that are 7.5" - have a look at last week's post on this. If the units are rectangles, that finish as a square, such as rail fence blocks, count how many rails there are. If the block finishes at 12" and there are 4 equally wide rails, then each rail will be 3" wide finished so you need to use four 3.5" wide strips to make each block. (12 divided by 4 = 3, 3+1/2"= 3.5" wide strips). I made a set of napkins from those pretty four patches I showed you earlier. I used four squares that were cut out to be 4". Did you quickly realize that the 4 patch block in my napkins is 7" square (4 - 1/2" seam allowance = 3.5" x 2 = 7"). Because I was adding the 4 patch by itself to a 14" napkin, I just used squares a size I liked, but you can see why this is not a standard size - no one really wants to have to be multiplying by something and a half to do their quilty calculations. The napkins are cottons from my Fluffy Sheep Quilting blogger bundle and Essex Linen on the front and a plain Essex Linen back. They are a bit heavy, my next set - I still have all those other 4 patches from the picture earlier - will use linen only on the front or the back but not both. If you want to make some napkins decorated by a 4 patch, you can always use my napkin tutorial which is here and then adapt it by deciphering your own 4 patches to add to the napkin. You might want to add a bit of quilting over the 4 patch to keep it from fraying from frequent napkin washing - I sewed up and down the seams of the 4 patch. If you have not yet read Jess's post about how to identify 4 patch blocks, head over to Elven Garden Quilts now to do that. 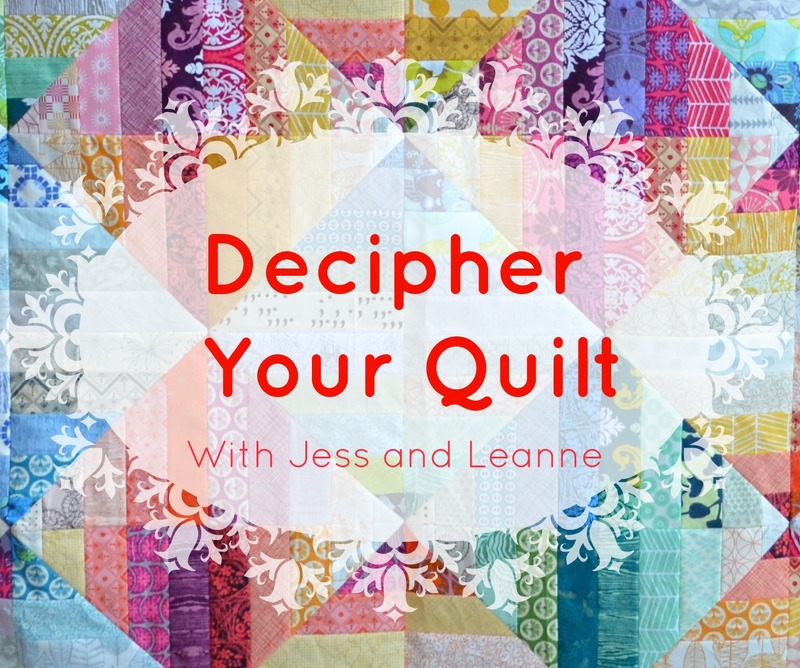 And if you make some napkins or one of Jess's blocks or project, please share it with us in the flickr group or on instagram using the hashtag #decipheryourquilt. If you have questions, include them in your comments and I will do my best to answer them. Next week for Decipher Your Quilt we have 9 patch blocks - my favourite blocks of all. And don't forget to enter the wonderful giveaway sponsored by Sew Me a Song, its here. This is great Leanne, you have such a knack for explaining this maths stuff so it is easy to understand. Reflections, which I luv, is hard to figure (see) but its a great post, Leanne! Oh! I see how you've pieced Reflections now! I love optical illusions in quilting. My brain always forgets seam allowances but that's a great tip to work everything out and THEN add the seams all in a oner. You've inspired me to try and work out the maths for an 11in economy block!! This is an excellent series you are doing, Leanne. It will help so many people. Looks like you have it all down pat, this math stuff! Great reference and great post.